“I wanted to go from A to B and somebody confronted me,” said Arsene Wenger after the game which, if he was talking about the match, would have been a fairly accurate description; instead he was talking about the touchline kerfuffle with Jose Mourinho which added an unsavoury side story to a well-contested, if a little scrappy encounter. Chelsea won 2-0 thanks to goals from Eden Hazard and Diego Costa, providing two moments of, well, moments if not outstanding quality in a largely even match-up. Yet Chelsea have that extra edge, that killer instinct that Arsenal perhaps do not possess. Or if they do, was not utilised properly. And that, in a sense, was the main source chagrin for Arsenal fans. Whenever these two sides play, talk is always of the gameplans and here, no side wanted to give anything away (though Arsenal did when Laurent Koscielny felled Hazard for the penalty). Yet Chelsea’s discipline was encased in a system they understand. Positional changes are minimal, most likely counter-specific, and the strategy coherent. Arsene Wenger chose again with their big-game 4-1-4-1 which is not incorrect in its thinking, but can be undermined by where he selects the player. Here, he wasn’t far off the correct balance – feasibly, all he had to do was switch Mesut Ozil and Alexis Sanchez around. As a result, with both players playing on their “opposite” side, Arsenal’s play was often too central. Of course, this is how Arsenal often play, looking to create overloads and then quickly switch play with a quick, penetrate burst across the line or from deep – though in this case there was nobody to make those runs. Wilshere actually got through a couple of times through neat interplay – and nearly did again but Santi Cazorla shot – but his touch let him down. Danny Welbeck, on the other hand, played curiously more deep-lying than he did against Galatasary, often picking up the ball in the gap just off the two Chelsea centre-backs. The difference in performance (forgetting opponent quality for a moment) showed how dependent instinct players, nay creative ones too, are on the energy and quickness of thought of those around them. In the aforementioned match, Arsenal had Alex Oxlade-Chamberlain stretching the pitch on one side and Ozil’s lateral movement, starting behind Welbeck, making Arsenal fluid. With Ozil starting wide right against Chelsea but never sticking there, it changed the dynamic of how he creates, instead of going inside-to-out; he was going the other direction without any real opposite movement. By switching Alexis to the right, perhaps Arsenal could have had that vertical pentration they sorely needed. In any case, despite his creative performance against Galatasaray, Alexis’s best position is probably on the right where he can burst behind as he’s not really the dribbler that he’s made out to be playing on the left. The lack of runners exacerbated the issue of the 4-1-4-1 because while Arsenal passed the ball neatly at times, it felt like cautiousness in possession for the sake of it. The joy with Arsenal is how the ball gets from A to B, often by getting off at stops C, D E and Z in the process: the new system, however, seems have a stifling effect on how well Arsenal move the ball – almost as much as Chelsea’s systematic fouling in this match. Nevertheless, Arsenal can still remain optimistic about this season – or more appropriately rather, this team – it just needs the right configuration, because there is an exciting blend in this side. The Gunners attempted 50 take-ons, a staggering amount considering that it was against Chelsea, a side known for their eagerness to close down spaces quickly. Perhaps, the extra dribbles Arsenal attempted were as a result of Chelsea’s tight marking, but at the same time, it shows a daring on the ball that Arsenal have lacked in the recent past. Looking at the other end of the pitch, the difference between Arsenal and Chelsea might have been summed up by Cesc Fabregas. Not because of the sumptuous pass he provided for Diego Costa for the 2nd goal, but because he delivered what was probably his most disciplined performance in any shirt – annoying it just happened to be for Jose Mourinho and significantly, against his former club. In front of him, Oscar and Diego Costa worked extremely hard in a pressing structure which was more coherent than Arsenal. Jack Wilshere talked about the “5-second rule” Arsenal have when they lose the ball or force the defenders back towards their own goal, though it was visibly evident that whenever he or Alexis pressed up the pitch, the other players didn’t follow – or at least not with the required intensity. On the whole, Arsenal moved up and down the pitch well last season, largely because they played 10metres or so deeper therefore it didn’t require as much fine-tuning. For Chelsea’s first goal, Arsenal seemed to be stuck a little in between whether to press or stand-off. Granted, The Gunners had just lost possession through Alexis thus they didn’t have enough time to recover but a more coherent strategy would have seen Arsenal get tighter and shuffle across. If it was a hard goal to deal with because Chelsea reacted quickly and Hazard is majestic in this form sort of form, jinxing away from defenders, it showed also how wingers can profit from space in between the full-backs and to the side of the holding midfielder (usually called the half-space). Ozil often exploits this space brilliantly when he plays as a no.10 by drifting wide and then combining quickly with the winger. Arsenal lost that with him starting out wide and he often had to come to the other side to combine. In the moments Arsenal got through, Jack Wilshere was the one who became the spare man and at times, overwhelmed Nemanja Matic. It didn’t happen enough however; Chelsea snuffed out the space well, especially the Serbian holding midfielder, who didn’t really impose himself due to his sheer physicality but by just “being there.” He has an almost OCDish quality about his defending, a preoccupation with the orderly which is a bit like “shall I go there? Of course I must go there; otherwise our structure won’t make a perfect 4-2-3-1.” Flamini was more eye-catching and busy but while his best work is usually around the edge of the box, he can be a bit standoffish when the ball is in midfield. Arteta, on the other hand, when he plays, is great when he gets tight and presses the opponents in the centre of the pitch, but not so good going backwards and forced to use his pace. It goes without saying, a modern, dynamic midfielder is one which would improve Arsenal massively. If that sounds a little demanding – because who is out there that fits the profile? 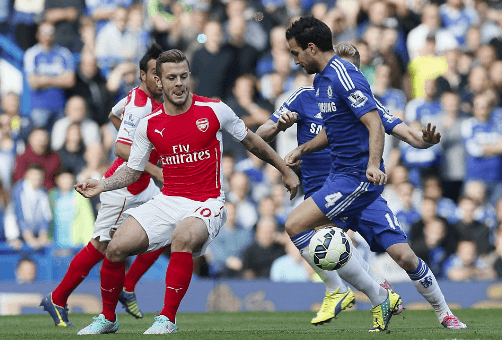 – that’s the margins Arsenal are judged on in the top matches. And it was margins that made the difference between Chelsea and Arsenal. With only two shots on target posted in the whole match, Chelsea scored with both of them.